The decision came into effect Saturday. On Sunday Syria said it condemns the ‘irresponsible’ Egypt decision to cut diplomatic ties, AFP reports. Morsi also condemned Hezbollah, the Shiite Islamic militant group based in Lebanon. Hezbollah fighters have reportedly been fighting alongside Syrian pro-government troops against the opposition forces in the ongoing conflict. The US has been giving consideration to the issue of setting up a no-fly zone across Syria and possibly along Jordan’s border after claims that nerve gas was used by the Syrian government, sources told Reuters. “Washington is considering a no-fly zone to help Assad’s opponents,” a senior diplomat told the agency. But Russian Foreign minister Sergey Lavrov has stressed that any attempt to establish the no-fly zone would be a violation of international law. 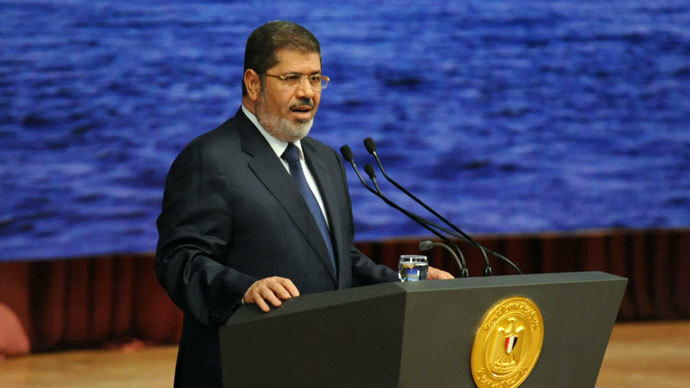 However, while calling for foreign interference into the Syrian conflict, Morsi has warned against any unrest at home as massive anti-government protests are planned to take place on June 30. “There is no place for the troublemakers [who threat] the nation’s security and stability. We shall decisively stop them,” he said as quoted by Ahram Online. Jason Ditz, news editor at antiwar.com told RT that Morsi’s support of the Syrian opposition is not surprising. ‹ 100-Year-Old General: We Razed Arab Villages, So What?